The new DigiEasel is a 40-inch digital whiteboard that can be used in smaller classrooms or meeting spaces. 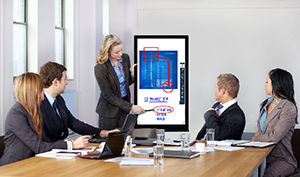 The DigiEasel has whiteboarding tools that can be used in smaller meetings or classes. InFocus has introduced a new touchscreen display that can be used as a digital whiteboard in smaller classrooms or meeting spaces. The DigiEasel is a 40-inch, 1080p-resolution, 10-point touchscreen that can be used for demonstrations and to record discussion and class notes. There are two models, both of which have built-in digital whiteboarding tools that can give users display and touch control with their Windows, Mac and Chromebook devices. Both models have edge-to-edge capability to act as touchscreens and don't require calibration. They come equipped with 20-watt speakers, a stylus and a tray. "We've all used big paper easels or dirty, old whiteboards when we've needed to spend a few minutes strategizing, brainstorming or confirming plans," said InFocus Product Marketing Manager Robert Detwiler. "DigiEasel's digital whiteboard lets you skip the search for a marker and instead lets you save your written notes to reference later." The DigiEasel with LightCast allows users to cast content from Android, Windows and Apple iOS and OSX wirelessly. It also has a built-in Internet browser and can connect to a campuswide network. With an add-on, the DigiEasel Sign Manager software, the DigiEasel can act as a digital sign to communicate information on a permanent basis. With the software, HTML5-based content can be displayed on either model. The DigiEasel is available now and DigiEasel with LightCast will be rolled out soon. The touchscreen display is available at an introductory price of $999 and the DigiEasel Sign Manager is available for $899. For more information, go to the InFocus site.